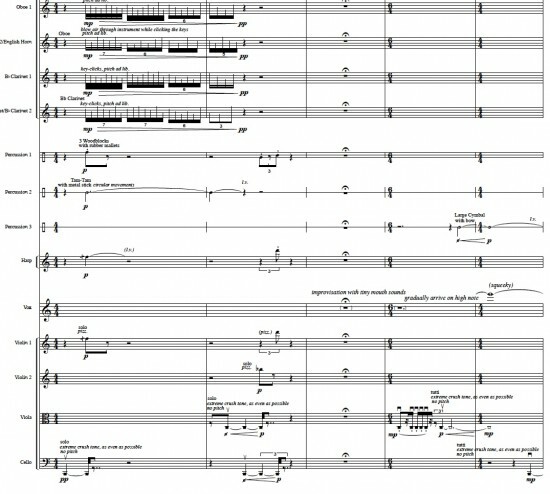 “Concerto for Voice (moods III)” is my first large work for orchestra. The commission from Radio France was to include my own vocals in a soloist part. This was a welcomed challenge as I have over the last years started to combine more and more my experience as both a composer and a performer, making new forms of music where improvisation and composition interfere and frame each other. Not trained as a classical singer, I use my voice in unidiomatic ways, drawing on experience and inspiration from free improvised music, electronic music and sound poetry. In “Concerto for Voice” the orchestral part is thoroughly composed in all its details, whereas the voice solo part follows, with few exceptions of some sustained pitched notes, guidance and frames for improvisation. Furthermore this concerto is the third part of a series of pieces called “moods”, where the first piece, “mono mood (S)”, an electronic piece based on saxophone spectrum, was made in 1997. “Concerto for Voice” is dealing with spectral harmonies and heritage from ‘concréte sound’ thinking, but is over all a concerto form where the voice and the orchestra are in constant contrast to or in coherent relation to each other. “Concerto for Voice (moods III)” was awarded as a recommended work under the International Rostrum of Composers in 2005. A version for smaller orchestra “Concerto for Voice (moods IIIb)” is available. Check also out this link for reviews of the piece! A new version for full orchestra “Concerto for Voice (moods IIIc)” was first performed by Trondheim Symphony Orchestra under Trondheim Chamber Music Festival 2015. This entry was posted in Chamber music with voice/Vocal music, Large ensembles and tagged moods, orchestra. Bookmark the permalink. Dear Edouard, me too! And thanks for the nice comment. I hope this will be recorded once. I am happy to know that it will be performed again at the Avanti! summer festival in Finland this year. I will even edit the orchestra part to make it better. I was there, the day Moods III was created at the Presence Festival, in the Olivier Messiaen, and was completely moved by this work. What a powerful music ! Definitely one of my biggest emotion in concert. Hope to hear on CD one day….